Who was `Abdu'l-Bahá, and why did He come to the West? ‘Abdu’l-Bahá’s health slowly improved over the summer, but reversed in the autumn, in part due to the activities of two of His recent travelling companions. 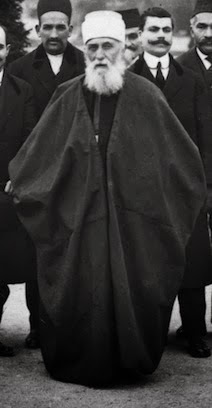 Tamaddunu’l-Mulk, who had been with the Master in London and Paris, was attempting to split the Bahá’ís in Tehran while Amin Fareed was defying His orders. By the middle of the next year, Fareed was in open defiance of ‘Abdu’l-Bahá and was travelling through Europe trying to raise money for himself using the name of the Faith. He arranged one such meeting in London which was prevented by the efforts of Lotfullah Hakim. Mason Remey and George Latimer also toured Europe to counter Fareed’s activities. Fareed’s appetite for money, which began in America with his efforts to pry money from Phoebe Hearst and Agnes Parsons, led to his expulsion from the Faith. Slowly, ‘Abdu’l-Bahá’s health continued to improve. At about 6 o’clock one morning, He went to the house where His secretaries stayed. Even though He had already done considerable work, He arrived to find every one of them still quite asleep. YES! YES! We are hearing the music now. . . .
From 1911 to 1913, `Abdu'l-Bahá, son of Bahá'u'lláh, Founder of the Bahá'i Faith, also known as "The Master," travelled in Europe and America after living much of His life in exile and as a prisoner. He was elderly and in frail health, yet amazed thousands of people with his penetrating talks and views. This blog provides but a glimpse. . . .
can be enlarged by clicking on them! has a PhD in Aesthetic Studies /Humanities and teaches at the Art Institute of Dallas. A Baha'i since 1971, she is most passionate about the subjects of Ridvan, the arts, the celebration of the Twin Anniversaries of the Báb and Bahá'u'lláh, 'Abdu'l-Bahá, Sarah Farmer, and Green Acre. With her husband, Tim Perry, she created a film about Abdu'l-Baha in America, "Luminous Journey." "It is certain that because this gathering has been a divine assemblage, it will never be forgotten and whenever recollected it will produce fresh delight. This is my wish."